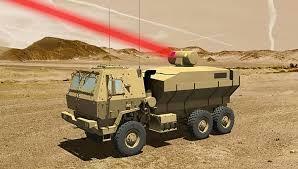 Raytheon is developing a mobile 100 kW laser weapon system under the U.S. Army’s $10 million High Energy Laser Tactical Vehicle Demonstration (HEL TVD) program contract. With the Pentagon flush with cash from the Trump administration, laser weapon systems have been a significant focus regarding research and development before the next round of global hybrid conflicts. 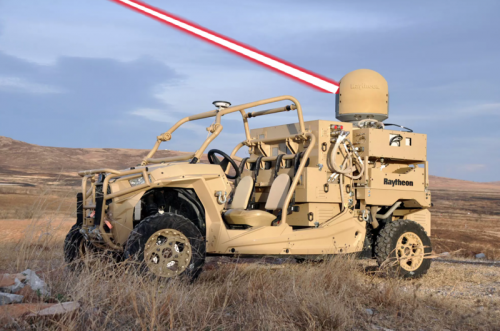 In a recent news release, Raytheon said the 100 kW laser would be mounted on a Family of Medium Tactical Vehicles (FMTV). “The beauty of this system is that it’s self-contained,” said Roy Azevedo, vice president of Intelligence, Reconnaissance and Surveillance Systems at Raytheon’s Space and Airborne Systems business unit. As Azevedo adds, “multi-spectral targeting sensors, fiber-combined lasers, power and thermal sub-systems are incorporated in a single package. This system is being designed to knock out rockets, artillery or mortar fire, or small drones." HEL TVD is part of the Army’s Indirect Fire Protection Capability, Increment 2 — Intercept (IFPC Inc 2-I), which is a rugged, mobile, pre-prototype laser system that meets the size, weight and performance requirements of the Army. The laser system mounted on the FMTV can eliminate aerial threats, including artillery, cruise missiles, drones, mortars, and rockets. To date, the program tested lasers at various strengths, from 2kW to 50 kW. Last year, Lockheed Martin announced it completed the development of a single-beam 60 kW laser for the program. The next phase, which could be as early as 2019, could test a massive 100kW multi-beam fiber-laser design, considered to be just enough directed energy to take down most aerial threats. Ahead of the coming "hybrid wars", the Army recognizes that lasers could provide a significant advantage over its adversaries. Laser weapons have “unlimited” ammunition, as long as a power plant can continue to deliver energy. With an average cost per kill of $30, laser weapons are significantly cheaper than traditional kinetic weapons, such as mortars and rockets that can range from several hundred to thousands of dollars per round. The Army will test and evaluate the mounted laser system on an FMTV in the first half of 2019. If successful, a three-year system development, and demonstration contract estimated at $130 million, to build and integrate a weapon system, could be next. The Army hopes by the Fiscal year 2022, the HEL TVD will have enough data through field training exercises that it could enter service shortly thereafter. The HEL TVD could see its first mission in the mid-2020s, as the most likely place for deployment could be the U.S. and allied force’s fixed and semi-fixed bases. 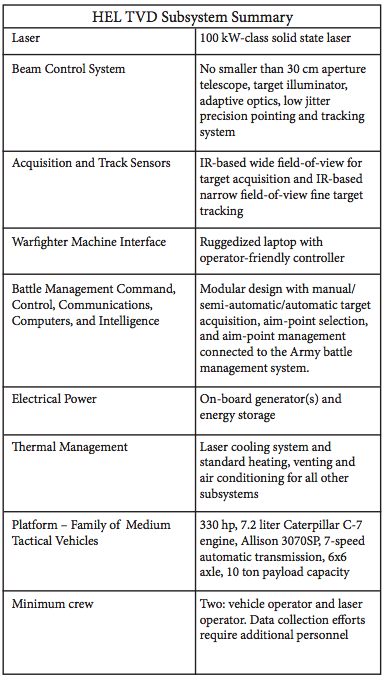 Over the year, the Army and U.S. defense contractors have been busy mounting lasers on all sorts of war machines. In March, Raytheon decided to mount a 5 kW laser on a militarized all-terrain Polaris light-vehicle. The company’s press release describes the vehicle as an “agile, mobile, and effective” war machine to protect troops from weaponized unmanned drone threats. The push for lasers could be explained by the Army’s rush to plug the gap in short-range defenses. Richard P. DeFatta, director, Future Warfare Center, U.S. Army Space and Missile Defense Command spilled the beans in February on air and missile defense and told an audience that Army conducted field training exercises with the first-ever Mobile High Energy Laser (MEHEL) mounted on the M1126 Stryker armored personnel carrier. The Stryker-mounted MEHEL is designed for short-range aerial threats, such as weaponized drones. 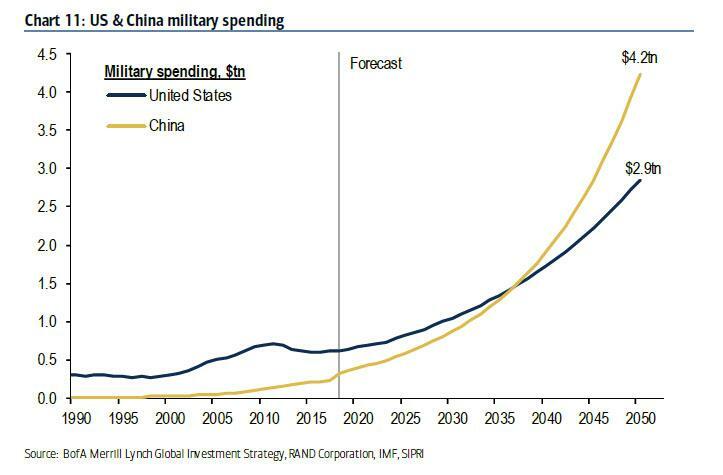 However, it is not just Washington and its military-industrial-complex mounting laser systems on exciting things. 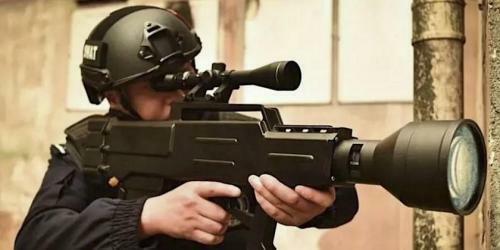 China announced earlier this week that its ZKZM-500 laser assault rifle could “burn through clothes in a split second… If the fabric is flammable, the whole person will be set on fire.